Time for some talking about a budget-friendly Android phone. While there are many announcements of hot Android products for the last one month, we almost forgets about the mid-end of the market. For those people Motorola yesterdays announced a new Android 2.3 Gingerbread running FIRE XT phone. It has a 3.5-inch touchscreen with a 5 megapixel snapper on the back. An 800MHz CPU runs the device with 512MB RAM by a large 1540mAh battery. The fashionable Motorola FIRE XT also offers unique personalization options through the Moto Switch user interface that enables users to switch between friend and work-centric modes depending on what they’re doing. It will be available in Italy by the end of November. 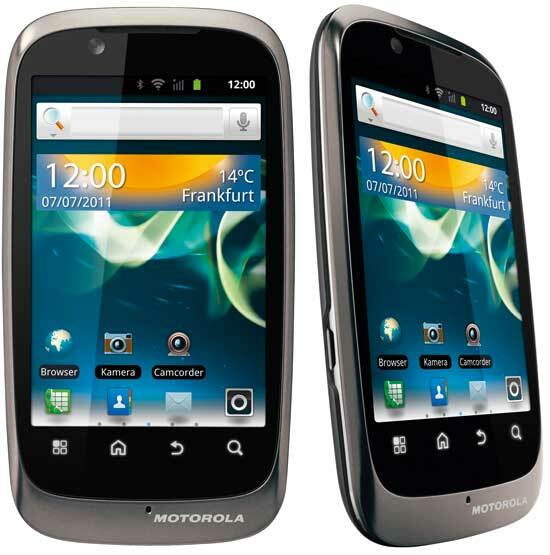 Without any kind of contract signing you can buy a Motorola FIRE XT just for 199 Euros ($282), including taxes. That’s not a bad deal at all. Read the press release to know all the details and specs sheet of Motorola FIRE XT. With Android 2.3, a bright 3.5-inch touch screen display and dual cameras, Motorola’s budget-friendly smartphone offers the fun of social media in a personalised package. MILAN – Oct. 28, 2011 — Now there is no need to sacrifice design or function with the Motorola FIRE™ XT, the new, slim and budget-friendly Android™-powered smartphone from Motorola Mobility Italia. The Motorola FIRE XT gives users an engaging experience with its 3.5-inch, extra-bright touch-screen display, dual cameras for vivid video capture, and all the social networking you want. Motorola FIRE XT comes in dark titanium and is expected to be available from the end of November in Italy at the recommended retail price of 199 euro without contract, including tax. Running on the latest version of Android 2.3 Gingerbread Motorola FIRE XT is the perfect balance of sleek design, affordability and intuitive functionality. Capture and share your memories in crystal clear clarity with its 5-megapixel auto-focus camera with built in flash. With the Qik Video Connect you can easily create videos and share with friends in real-time. You can also use the Qik app with the front-facing camera for video chatting. Typing text and email messages is faster and easier with the touch-screen keyboard. Plus, with access to leading social media applications users can stay in constant contact with friends and family. The fashionable Motorola FIRE XT also offers unique personalisation options through the Moto Switch user interface that enables users to switch between friend and work-centric modes depending on what they’re doing. Motorola FIRE XT also has best-in-class battery life, allowing users to talk for up to eight hours or have 28 days of standby in 3G mode1. The battery can handle regular multitasking between apps, games and Web browsing, as well as heavy messaging. Users also have access to more than 250,000 apps from Android Market™. For more information on Motorola FIRE XT please visit www.motorola.com/mobility. A video on Motorola FIRE XT+ can be found here. Motorola Mobility, Inc. (NYSE:MMI) fuses innovative technology with human insights to create experiences that simplify, connect and enrich people's lives. Our portfolio includes converged mobile devices such as smartphones and tablets; wireless accessories; end-to-end video and data delivery; and management solutions, including set-tops and dataaccess devices. For more information, visit motorola.com/mobility. 1 All Talk and Standby Times are quoted in Digital Mode, and are approximate. Battery performance depends on network configuration, signal strength, operating temperature, features selected, and voice, data and other application usage patterns. 2 Available user memory varies due to the configuration of the phone, which varies by service provider. 3 3G Mobile Hotspot may incur additional charges. Contact your service provider for details. MOTOROLA and the Stylized M Logo are trademarks or registered trademarks of Motorola Trademark Holdings, LLC. Android, Android Market, Google Mobile, Google Maps and Google Talk are trademarks of Google, Inc. All other product or service names are the property of their respective owners. © 2011 Motorola Mobility, Inc. All rights reserved.